NEW SOUL ART DOLL WORKSHOP! I am facilitating a Soul Art Doll Journey in my new home studio space in Boulder on Sunday, December 4th. I am so happy to begin teaching again following the completion of my degree in Counseling Psychology at Regis University last August. The workshop is filling up quickly. Please contact me if you are interested in joining us! 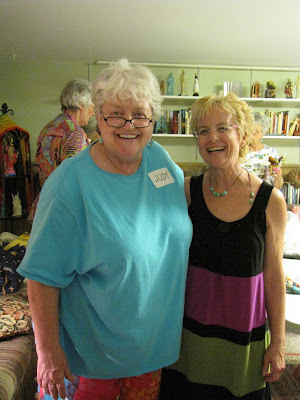 Below are photos from a wonderful Soul Doll workshop I facilitated at the home of Judy Masseli in Denver. We had an amazing group of wildy creative women. Thank you Judy! Abby Patner Glassenberg's book "The Artful Bird" is my latest inspiration. I am an intuitive artist. All of this clearing and grieving has inspired me to expand my technical skills...just a bit. My birds may not even be birds by the time my process kicks in...It is fun to see what might come through at any moment! In this photo you can see "The Hide and Seek" sailing in the midst of all of the inspiration created by my friend, Julie, in England from My Curious Tea Party. 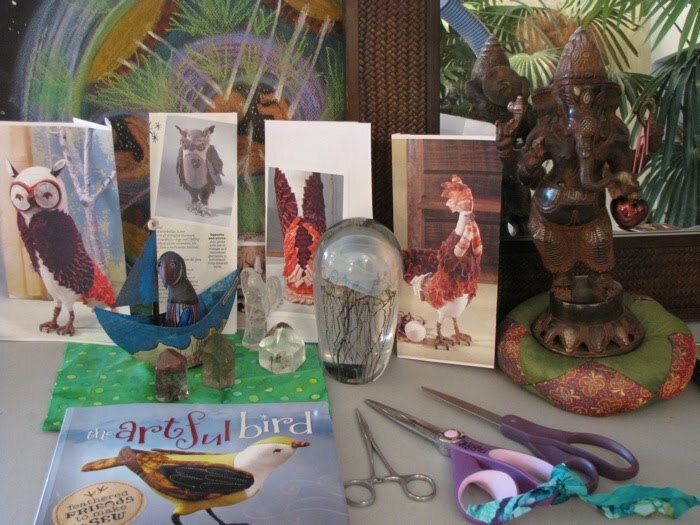 There is also a small picture of an owl from The Artful Bird book by another favorite artist, Ann Wood. And, of course, Ganesh dancing among the creative forces. I finally was able to replace my Viking sewing machine that was waylaid in my life transition. I couldn't take it out of the box for almost a week because George claimed it as his own the moment that it arrived. It felt like he may have been on the nest waiting for the beloved eggs to hatch! 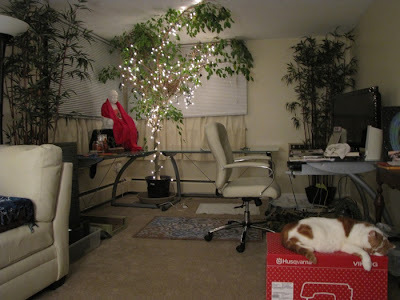 The process is beginning once again...Here is a peek at the evolution of my small home studio as well. 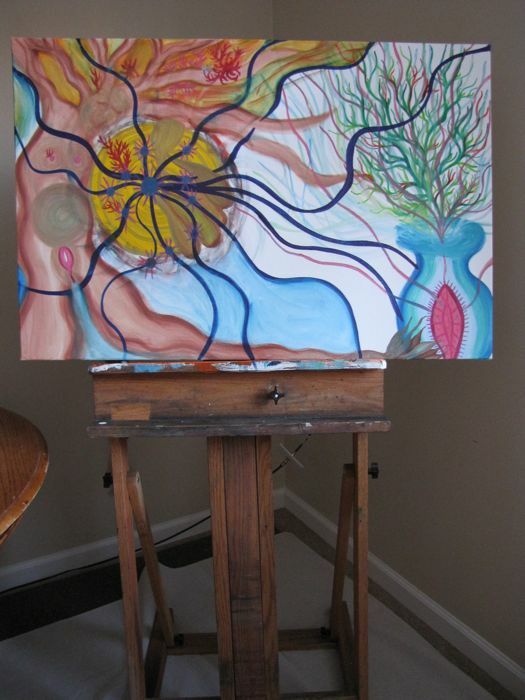 Here is my first painting in so very long...in process. I realized today that I have been having such a lovely time pouring over the images in everyone elses blogsites...It is time for me to return to myself. Find my artistic voice once again...always in a new way. Following so much turmoil and trauma after my year of many moves and so much loss. New beginnings are emerging. Like the brightest green sprouts of new grass...bursting through the now melting ice. 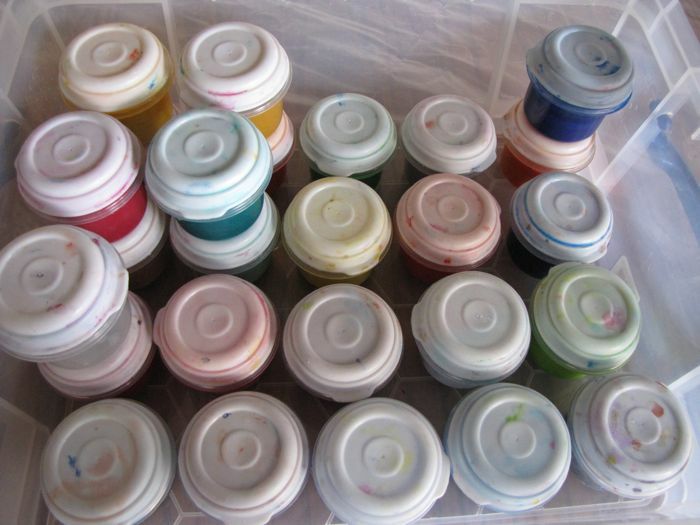 My Lascaux Resonance Gouache paints are infused with Bio-information. They smell like essential oils and have healing properties. So delectable! 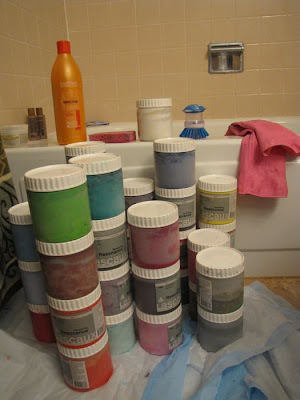 I resurrected many of my paints today! It looks like someone has been murdered in technicolor in my bathtub...Not to mention my clothes and my glasses! 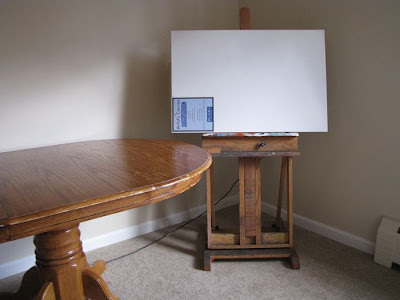 I found a nice oak easel on craigslist yesterday...and a table to hold my paints and brushes. More new beginnings...Or at least, finding my way back to myself in small, and sometimes large, gestures. I placed the easel so that I can observe my creations from my bed when I wake up in the mornings. 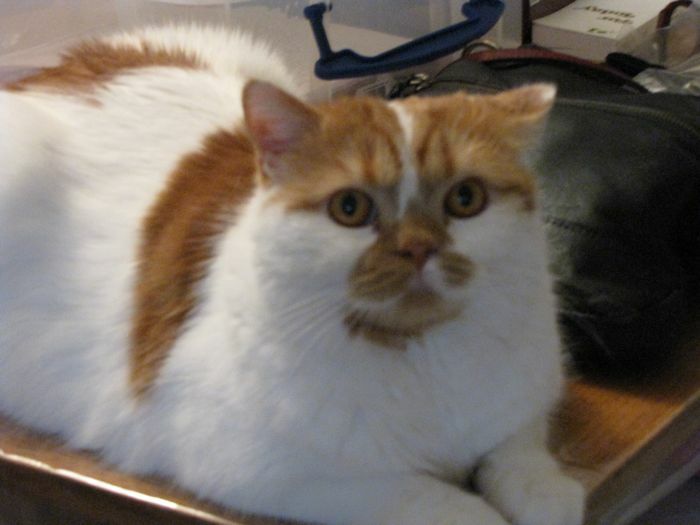 George is my studio manager. He oversees all projects. He has been spending a lot of time holding the space underneath my new easel! The Scarab Ox Woman came from a combination of two dreams. One dream was about being rescued and supported in a victorious way from an abusive situation. There was a giant, powerful Ox standing in the doorway to support me unequivocally. I have also been having dreams about ancient giant beetles. I was immediately mesmerized by an assortment of vintage Egyptian scarab beads that one of the participants in my Soul Doll workshop brought to sell. My Homeless Self came through in a powerful way after watching the movie "The Soloist." I think that we all have some form of her deep inside of us. A longing for "home." It may be a part of the nature of being human and experiencing a separation from the Divine. I love the shopping cart! It turns on a dime. I also used photographs of me when I was a child. I am sitting in the mini-cart being held by the larger self doll. A photo "tree" attached to the shopping cart with pictures of me with my father. Close up of my two selves safely contained in their shopping carts. The cart is adorned with strings of tiny brass Indian bells and miniature wind chimes! There is also a Native American dream catcher on the bow of the cart. 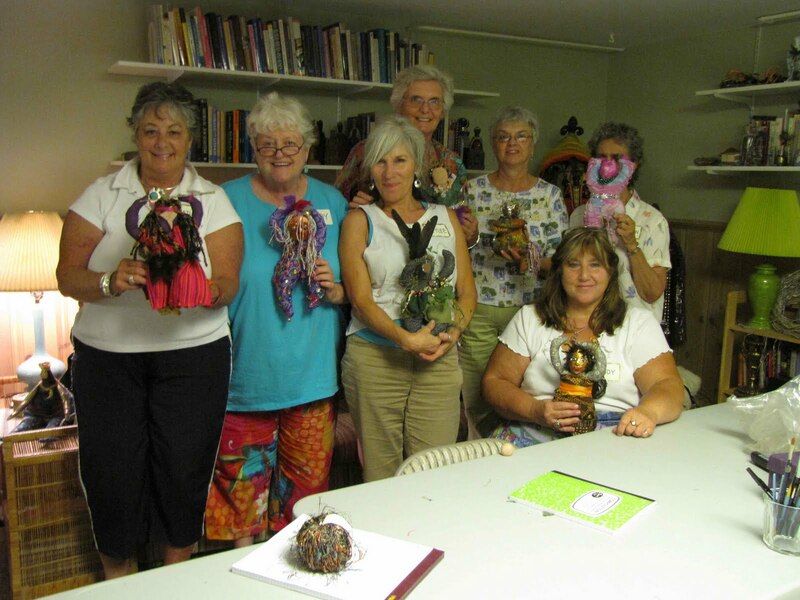 Participants in my "Soul Doll" workshop at Tactile Arts Center in Denver! Hello everyone! Apparently, I have taken a summer break from blogging...I am starting to, finally, feel like myself again following my surgery. Even better than before! 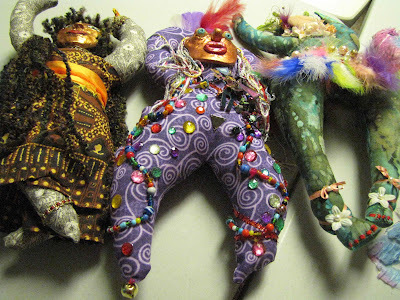 I am now teaching my "Soul Doll" workshops which is a dream come true for me. I will post my Spring schedule soon. Thanks for your support on my journey back! Here is one of my "Alchemical Warriors." She is being held in the arms of the Great Mother. I feel a sense of peace when I look at her. This photo shows a statue of Gaia sitting below Quan Yin. You can also see a wonderful wooden horse puppet who lost his strings. Another "Warrior" is leaning against the horse. 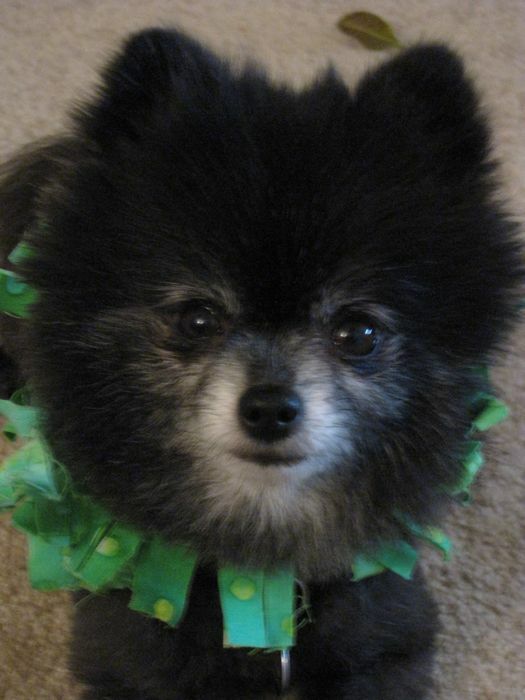 She has a large green crystal heart on her body. Another "Alchemical Warrior" with an African porcupine quill for a sword. He's riding in BaBa Yaga's pestle! I like this mysterious night view of two folk art dolls with the wooden horse. 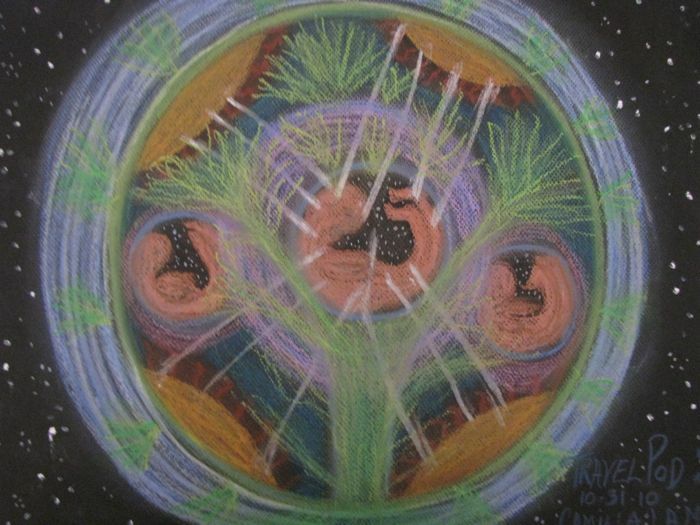 They are standing in front of a mounted Nature Mandala. Here is the "Pink Goddess Alchemical Warrior." 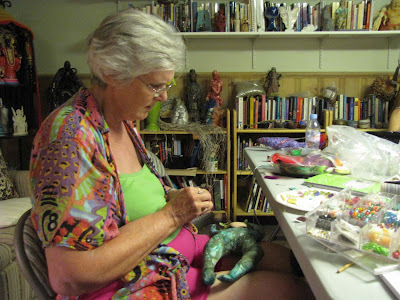 She has an owl and a carved, wooden Japanese Netsuke that is a snake. I painted a design on this feather.. In my graduate program in Counseling Psychology, we spent the entire day Friday exploring sand trays. The moment that I arrived home, I realized that the carved antique boat given to me by a friend was about to be transformed into a giant sand tray. The next day, I brought 300 pounds of sand into the middle of my living room and set to work. The transformation that took place both physically and spiritually was profound. It turned into a giant healing altar that is giving me great comfort and delight! A few weeks ago I had six dolls pour through my fingers at once. I call them my "Alchemical Warriors." They represent important parts of myself. They are all participating in this tray. I have included pictures of three of them from close angles. This week, I have been building a new set of shelves next to the sand tray so that my collection of objects for the tray can be readily visible for the creation of many more trays. I have asked friends to participate if they would like to contribute any found objects to this evolving project. I use everything that feels appropriate...angels, driftwood, bones, shells, toy figures, dolls, statues...The possibilities are limitless. I can feel my soul soaring just thinking about it! A more formal Fairy Garden with swans swimming in the antique "pond. "If you look closely at the photo below, you can see that there are swans swimming in the vintage, mounted postcard as well! A large box of these beautiful shells arrived on my doorstep a few weeks ago. My dear friend from Santa Barbara, Theresa, collected them in the Yucatan in 1978 and decided that I would certainly make good use of them now...an accurate assumption! A large Guardian Angel watches over the garden on the right hand side of the photo...a bit like my special angel, Grace.You can see a smaller Guardian Angel inside the garden in the photo below. A full view of the miniature garden world. I got the blue cradle at my favorite thrift store for $3.00! I also used pieces of driftwood from the beach in Santa Barbara around the edges...more gifts from my lovely care packages from friends and family! I love making these magical gardens! In my final class for the summer in my Counseling Psychology program today we made Jungian sand trays both as a group and individually. The timing was so appropriate in light of my recent gardening adventures! I had a dream the night that I created this Fairy Garden that I had a new tiny uterus that was growing in an antique dish in this garden. It was wrapped in a pod of ancient leaves. I woke up with a wonderful sense of new growth and possibility. I love this photo of the garden fairies sharing a relaxing visit in the cool garden. This lovely garden poured through my fingers yesterday. It is giving me a great sense of joy and magic! I have been spending some good healing time in my fairy garden over the past month. I am happy to be able to post some photos of my garden and my companions in the garden. I have missed all of you, my blog friends...I am making an effort now to balance my outdoor time with a little catching up with you and your blogs. She is both a chrysalis and a butterfly at the same time. Here are the art pieces that have been flowing through me over the past few weeks. I am happy to say that I am finally beginning to feel like myself again following my surgery. It feels as if my soul has returned to my body. My life force is becoming strong once again. Thank you for all of your emails of support during the challenging past four months. I am looking forward to catching up on your fabulous lives and creations! Sushi, Bead Workshop, and Lovely Gift! "Your Current Safe Boundaries Were Once Unknown Frontiers"
I had a dream last night about meeting a wonderful man for sushi. You will see below that the quote that I used around the plate in my drawing was waiting for me in my mailbox when I returned home last night. I had just finished a therapy session related to opening myself up to the possibility of having a loving relationship with a wonderful man one day...I put the Japanese symbol for love at the top and marriage at the bottom. Here is a photo of me with Robin Atkins at her Bead Embroidery workshop in Denver last weekend. It was such a treat to finally meet her in person! I also took her Beaded Treasures workshop. It brought tears to my eyes to see her beadwork pieces in person...so lovely and inspiring. I learned so much! I haven't left the house all week...I can't stop beading! Here is part of my bead sampler from the embroidery workshop...Making barnacles is my favorite today! I am hiding things inside of them...stars, photos...very magical. And, at last, here is the beautiful Klimt doll that Jacky created specially for me. What an honor! Thank you, Jacky...How did you know to use the luscious pink and orange??? Maybe you were peaking at my house/studio photos...I am very touched and grateful. I had a dream that I was the White Buffalo Woman. I was riding a giant buffalo along a cliff on an open prairie. There was a voice instructing me to perform a ritual and look for a vision. The Buffalo represents "Manifesting Abundance Through Right Action and Right Prayer" according to Animal Speak by Ted Andrews. George had his own idea of a vision for this photo shoot. He settled in for a snowy spring nap with Buffalo Woman. I am exploring many alternative options to speed my surgery recovery. Medically induced menopause has proved to be a far greater challenge than I ever imagined. 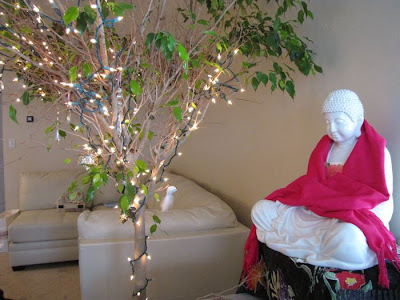 I am striving to balance my hormones, brain chemistry, emotions, and physical healing. I often combine elements of the sea and the mountains when I create my art dolls. I grew up on a beach in Southern California and I now live in the Rocky Mountains of Colorado. I have always turned to nature as my source of healing and grounding so it is only natural that this passion reveals itself through my dolls.